Looks like Philadelphia Eagles head coach Andy Reid has had a change of heart as Michael Vick was named the new starting quarterback today. This is kind of surprising as Andy has said numerous times that Week One starter Kevin Kolb would reclaim his job when he returned from his concussion injury. Normally when Reid makes a statement like that, he sticks with it. What’s more surprising me more then Reid changing his mind, was him actually doing what his fan base wanted. Typically, he does the opposite. I think the evidence this time, that Michael Vick was better suited as the Eagles starter was too much to deny. Vick has put up Pro Bowl caliber numbers in only a game and a half of playing time. Week 1 against the Packers – 16/24 with 175 yards passing and a touchdown. 11 rushes for 103 yards. Week 2 against the Lions – 21/34 with 284 yards passing and two touchdowns. 7 rushes for 37 yards. Put it all together and Vick is 37 for 58 with 459 yards passing and three touchdowns, while rushing 18 times for 140 yards. His passer rating is a 105.5, good for fourth in the NFL. His 63.8 completion percentage is the highest by far in his career. Vick has never played this well in his career and I’m not sure if he can keep that up. He is surrounded by more talent then he ever had with the Atlanta Falcons but this is a huge difference from his career norms. I think as soon as defenses get a little more current film and better game planning on him, those numbers will drop. 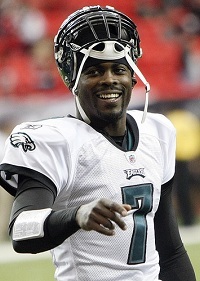 Whether that drop off happens or not, Vick has proven that he is the best QB on the roster to lead this Eagles offense. The Eagles have been a perennial playoff contender for years and with that their rabid fan base will not allow a complete season of rebuilding. And that is what this season would be if Kolb was allowed to stay the starter. They’re a young team and need someone who can lead them, not someone who can grow with them. Michael Vick is that man, hopefully Reid decides to stick with this decision as it’s in the best interest of his team and himself.